It was deep into autumn in the Hundred Acre Wood. Almost everyone was gathered at Rabbit's house for a party. There was Tigger, sporting his dark glasses; no longer the bouncer he had once been. He was nursing a cup of his favorite "Strengthening medicine" beside Roo who was there representing his mother as well, who had stayed home with a bad case of bursitis. Off to the side of them Eeyore was sitting in a heap by the door, his sawdust filling having settled years ago. He was listening to Rabbit and Piglet arguing loudly in the middle of the room. "I'm telling you it has to be done," Rabbit exclaimed. "B-b-but it's not right," Piglet responded, "we should be able to take care of him." "That's what we're doing," Rabbit answered back. "We're his f-f-friends," said Piglet. "Exactly. That's exactly the reason we should do it. Tigger gets it. Don't you Tigger?" Rabbit turned to his best friend for support. "None of us are getting any younger ourselves, Piglet. He needs round the clock care. You know that. What happens if there's an emergency, and none of us are able to help him?" Tigger said. "Besides," Roo jumped in, "we all saw what happened to Owl in his last days. Do you really think you could handle watching Pooh, deteriorate like that?" Piglet swirled a drink in his hand watching the ice melt into the punch. He couldn't face the others and for several minutes let them continue their verbal assault. Finally he looked up, tears in his eyes. "Why today? It's his b-b-birthday today." Rabbit took Piglet's hand and softened his voice. "What better time than when his friends are gathered with him? You've heard him yourself, Piglet. Lately he's talking like Christopher Robin is here with him. Christopher Robin hasn't been been seen in these woods since he was 14." "Besides," said Eeyore, weighing in for the first time, "this is a good clinic we'll be sending him to. I stayed there myself a decade ago and they really helped me work out things. Owlsheimer's can't be treated, but they can make him comfortable there. "Alright," said Piglet. "You guys are right, of course. He needs help beyond what I can give. But after the party. Let him enjoy once last hurrah." "Of course," said Rabbit. "Say, where is Pooh? He should have been here hours ago." Pooh was at that moment, crossing a stream. A single log lay over top, knotted and hollow. Ahead of him was Christopher Robin, 10 years old, hair wild and blowing in the wind. The sun was shining down through the tree tops scattering shadows around them. Leaves blew fiercely, to and fro, as if unable to make up their mind where they were going. 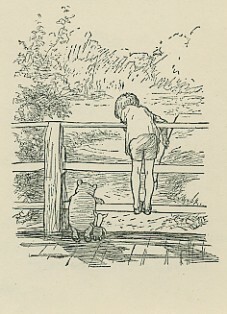 Across the stream now Pooh held his friend's hand as they walked. "You kept your promise didn't you, Pooh?" asked Christopher Robin. "Of course I did. Which one is that again?" Pooh replied. Christopher Robin laughed. "That you wouldn't forget me." "Oh no, Christopher Robin, I would never do that." "Even when I'm a hundred?" "How old am I again?" Pooh fretted. "Oh yes, that's right. I remember, just sometimes I forget about the nines that weren't. As they were talking they came into a clearing in the trees where the sun shone down in a big circle. In the middle, looking almost raked together, a big pile of leaves were gathered. "Pooh, I have a thought," said Christopher Robin. "What if we just kept walking, you and me, until we can't walk anymore?" "Yes Pooh," Christopher Robin answered. "I like that idea very much," Pooh replied. And walk they did, even as the bright sun set, and the night came on with all the sounds of the forest. Even as the bullfrogs splashed in the puddles trying to impress each other. They walked till the stars above told stories about the times that were and the times that weren't. They walked until they could walk no more.